Crispy Eggplant Pitas Fill 1 Created with Sketch. Originally from India, cucumbers (the fruit of a flowering vine) have been cultivated for thousands of years. There are dozens of unique varieties, with their own colors, shapes, tastes and textures. 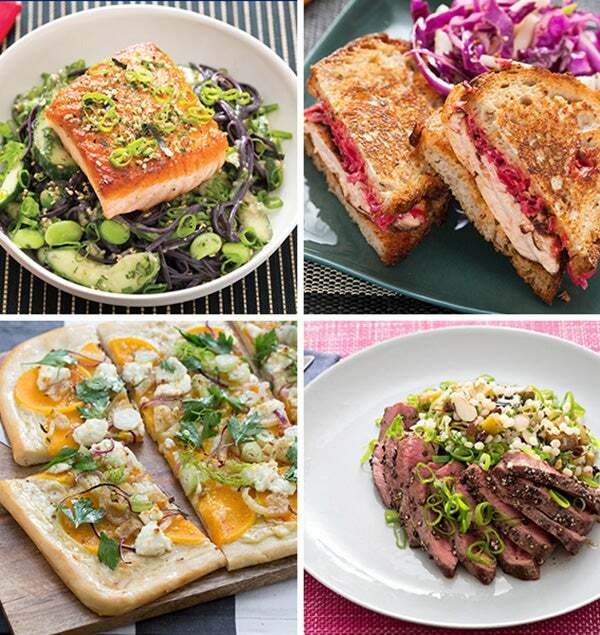 We’re featuring a delicious variety in this updated take on classic Mediterranean street food. Persian cucumbers are small and delicate, with thin skin that doesn’t need to be peeled. 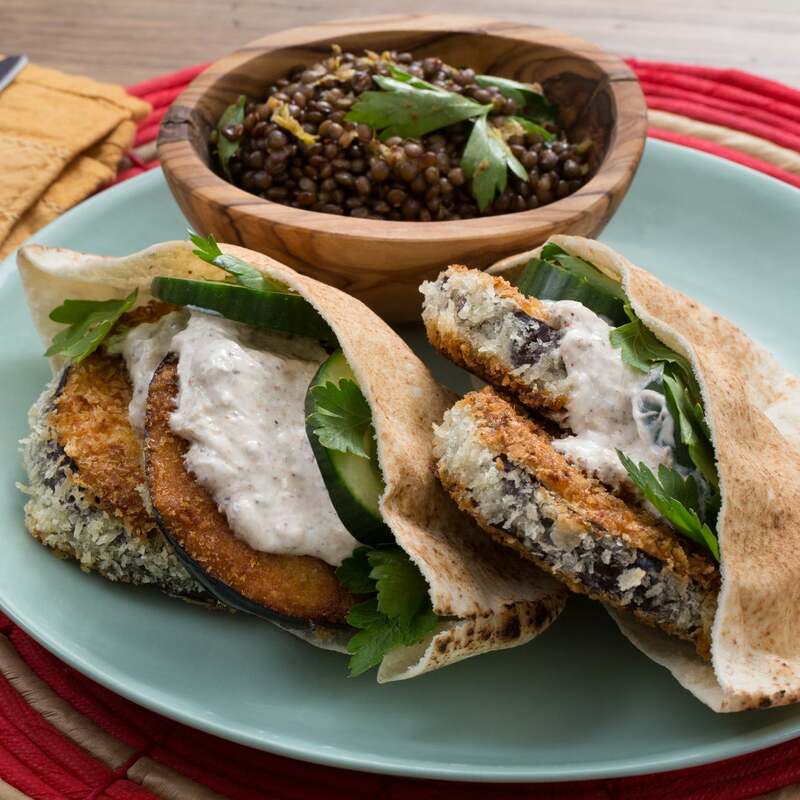 Alongside crispy eggplant rounds and a creamy yogurt sauce, the Persian cucumber slices add cooling, juicy crunch to the pitas. Preheat the oven to 400°F. Heat a medium pot of salted water to boiling on high. Once boiling, add the lentils. Cook 18 to 20 minutes, or until tender. Turn off the heat. Drain thoroughly and return to the pot. While the lentils cook, wash and dry the fresh produce. Cut off and discard the ends of the eggplant; slice the eggplant into 8 rounds, each about ½ inch thick. Peel and mince the garlic; smash with the side of your knife until it resembles a paste (or use a zester). 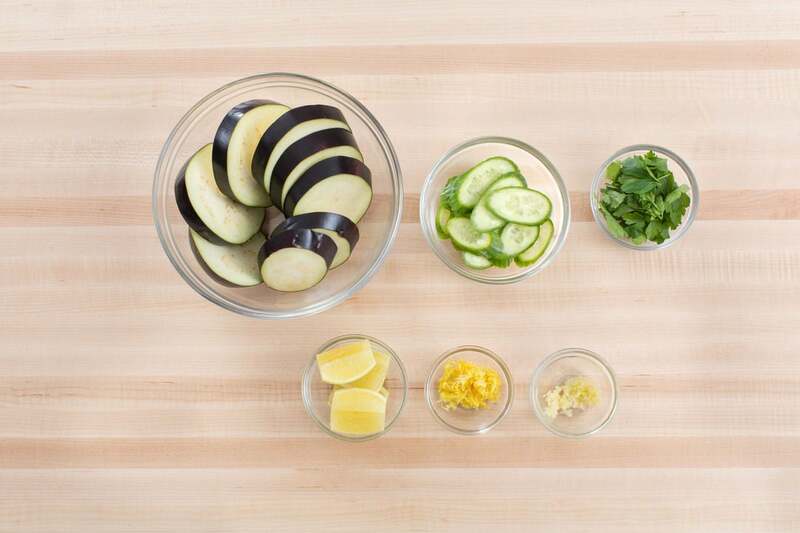 Slice the cucumbers into ¼-inch-thick rounds. 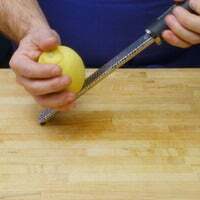 Using a peeler, remove the lemon rind, avoiding the pith; mince the rind to get 2 teaspoons of zest (or use a zester). Quarter and deseed the lemon. Pick the parsley leaves off the stems; discard the stems. 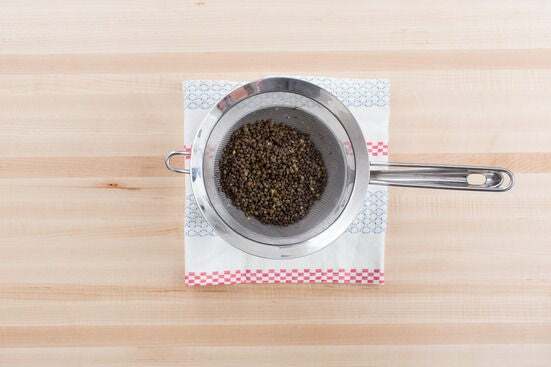 While the lentils continue to cook, in a medium bowl, combine the flour and ⅓ of the spice blend; season with salt and pepper. In a second medium bowl, combine half the yogurt and ¼ cup of water; season with salt and pepper. 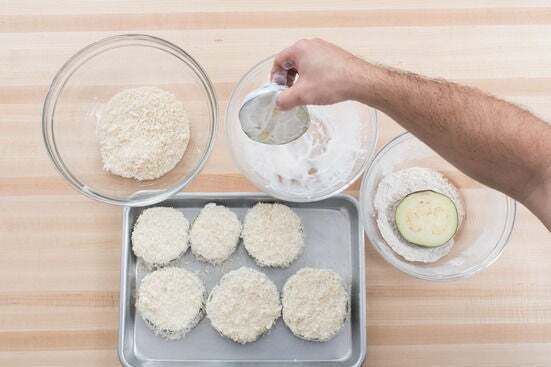 Place the breadcrumbs in a third medium bowl. Working 1 at a time, completely coat each eggplant round in the flour mixture (shaking off any excess), then dip in the yogurt mixture (letting the excess drip off), then coat in the breadcrumbs (pressing down firmly). 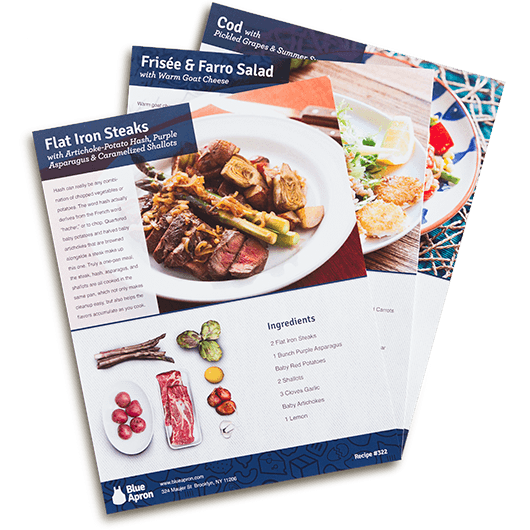 Place on a sheet pan (or plate). While the lentils continue to cook, in a large pan (nonstick, if you have one), heat a thin layer of oil on medium-high until hot. 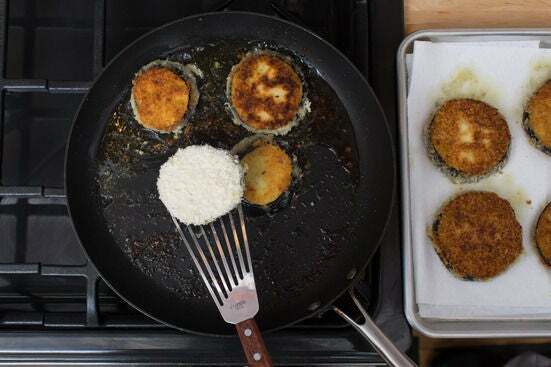 When the oil is hot enough that a few breadcrumbs sizzle immediately when added to the pan, add the breaded eggplant in a single layer. (If necessary, work in batches.) Cook 4 to 6 minutes per side, or until crispy and browned. Transfer to a paper towel-lined sheet pan (or plate). Immediately season with salt. 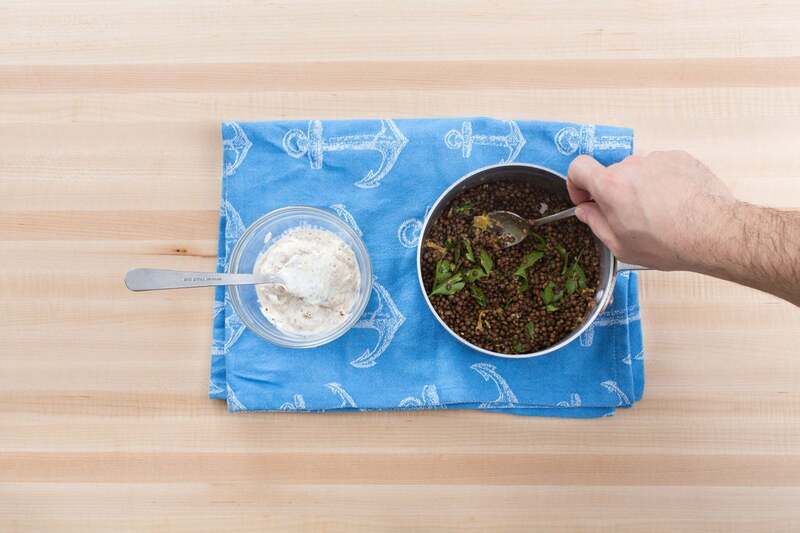 While the eggplant cooks, to pot of the cooked lentils, add the lemon zest, half the parsley, half the remaining spice blend and the juice of 2 lemon wedges; stir to combine and season with salt and pepper to taste. In a small bowl, combine the garlic paste, remaining yogurt and spice blend and the juice of the remaining lemon wedges; season with salt and pepper to taste. Carefully place the pitas directly onto the oven rack. Toast 2 to 3 minutes, or until lightly browned and warmed through. Remove from the oven. 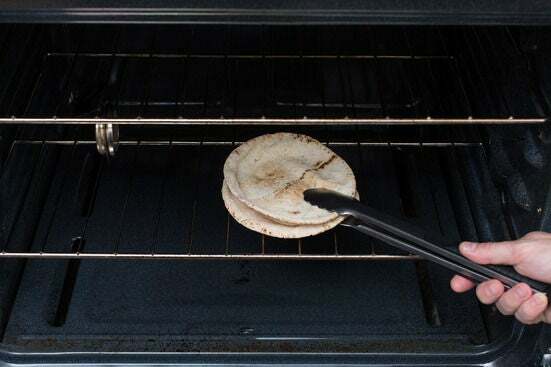 Cut the toasted pitas in half and open the pockets. 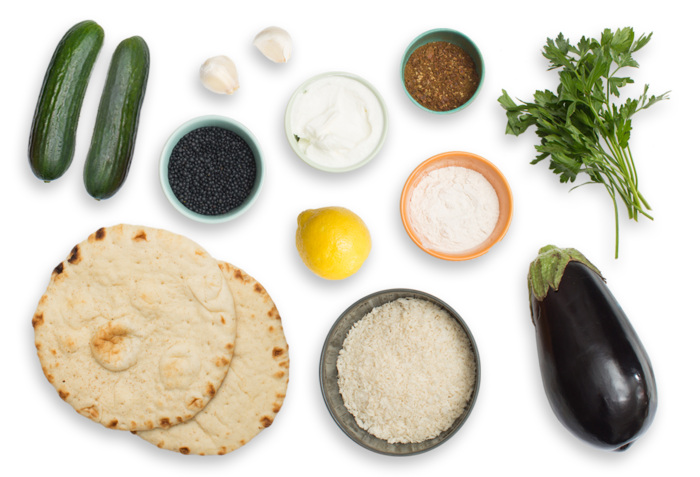 Divide the cooked eggplant, cucumbers and yogurt sauce between the pita halves. Divide between 2 dishes and serve with the lentil salad on the side. Garnish with the remaining parsley. Enjoy!